Today we continue our Presidential Geography series, a one-by-one examination of the economic and demographic peculiarities that drive the politics in all 50 states and the District of Columbia. Today’s stop: Georgia, the Peach State. FiveThirtyEight spoke with Merle Black, a professor of politics and government at Emory University, and Charles S. Bullock III, a professor of political science at the University of Georgia. In 2003, when Sonny Perdue was sworn in as Georgia’s 81st governor, it was the first time in 131 years that the state had elected a Republican to its highest office. Democrats had dominated politics in Georgia for decades, but the state’s transformation into a Republican stronghold, once it began, was swift. Today, Republicans occupy every statewide office and control the Georgia Senate and the General Assembly. 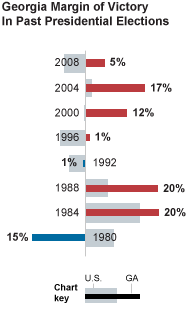 Likewise, Republican presidential candidates have carried Georgia since 1996 and overperformed their nationwide popular vote in every election since Jimmy Carter, a native Georgian, was last on the ballot in 1980. Yet, in 2008, the Obama campaign considered contesting the state. President Obama opened 25 field offices and managed to garner 47 percent of the vote and hold Senator John McCain to a 52-percent victory. Despite Georgia’s steady shift away from its Democratic roots, the state is often pointed to as the next possible Virginia or North Carolina, Southern states carried in 2008, for the first time in a long time, by a Democrat. And Georgia has been raised again as a possible Democratic target in 2012. The reason: The number of minority residents in Georgia has increased dramatically, particularly in the Atlanta area. Black residents made up 31 percent of the state’s population in 2010, up from 26 percent 2000, and the percentage of Hispanic residents increased to 9 percent, from 5 percent. But to an extent not evident in Virginia and North Carolina, there has been a mass exodus of white Southerners from the Democratic Party, fueling the Republican ascendance. In 2008, just 23 percent of white voters in Georgia cast a ballot for Mr. Obama, the same share that voted for Senator John Kerry in 2004. In Virginia in 2008, that number was 39 percent. In North Carolina it was 35 percent. The difference is not enormous, but it seems enough to keep Georgia in Republican hands for the foreseeable future, Professor Black said, and Mitt Romney will likely have little trouble winning the state’s 16 electoral votes. Most of the state’s voters are clustered in and around Atlanta, which anchors the ninth most populous metropolitan area in the nation. The city itself is overwhelmingly Democratic, and the surrounding counties, once solidly Republican, have become more competitive as Atlanta’s population — swelled by an influx of black migrants and Hispanic and Asian immigrants — has radiated outward. The bulk of Democratic votes are still found in Fulton County, home to Atlanta; DeKalb County; which has one of the nation’s largest communities of affluent blacks; and Clayton County. But as middle-class blacks and Latinos have moved from Atlanta to the suburbs, Gwinnett, Cobb, Douglas, Rockdale and Newton Counties have all become more competitive. Beyond Atlanta, areas of Democratic strength in Georgia are limited to the state’s midsize cities, like Augusta and Athens, and the Black Belt, a stripe of majority African-American counties running from south of Columbus in western Georgia to Augusta in the east. Republicans are dominant everywhere else. 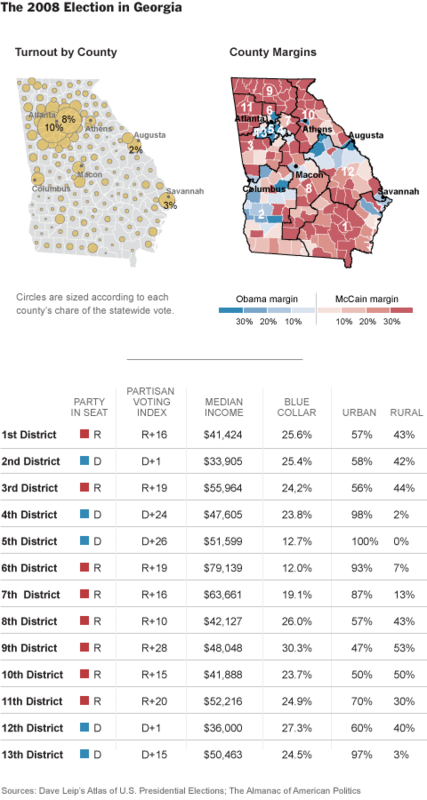 In northern Georgia, Mr. McCain won every county by at least 30 percentage points and more often by 50 to 60 points. The area’s lakes and mountains make it a popular destination for vacation homes and retirement communities. The region is predominantly white. 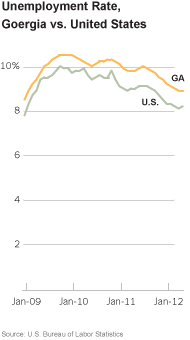 Hispanics, not blacks, are the largest minority group, drawn to northern Georgia’s jobs in small manufacturing and agribusiness. Southern Georgia, where peanuts, tobacco and cotton are grown, is mostly farmland and more sparsely populated. The southeast is almost as solidly Republican as the north. For an indication of what the final margin in Georgia might be on Nov. 6, look to Lowndes County. In the last three presidential elections, Lowndes voters have given each major-party candidate within 2 percentage points of their statewide share of the vote. Through 2012, the voters Democrats have gained in Georgia from the state’s growing minority groups have largely been canceled out by the white voters the party has lost. Indeed, Mr. Obama has just a 3 percent chance of winning Georgia’s 16 electoral votes according to FiveThirtyEight’s current projections. The Democratic fall in Georgia has been deeper and more complete than in Virginia and North Carolina. For instance, while Mr. Obama won large majorities of young voters in North Carolina and Virginia in 2008, he lost voters ages 18 to 29 in Georgia. According to exit polls, the proportion of votes cast in Georgia by non-Hispanic whites has dropped over the last two decades, from 79 percent in the 1992 presidential election to 73 percent in 1996 and 2000 to 70 percent in 2004 to 65 percent in 2008. But it has not yet dropped enough for Democrats to rely so exclusively on minority support.